Yes, Mike Connors celebrates his 88th birthday today, and he's a TV favourite of mine that I've long wanted to pay tribute to. Mike, of course, spent eight years from 1967 to 1975 playing the role of private investigator, Joe Mannix on the CBS hit series, Mannix. Apparently the show was not an immediate hit though, and was in danger of being cancelled if not for the intervention of Lucille Ball, whose production company, Desilu (formed with former hubby, Desi Arnaz) had produced the show. Lucy felt strongly that the series had merit and convinced CBS to stick with it. The show actually started out a bit differently in its first season, with Joe Mannix working for a technology-based detective agency called Intertect, run by Lew Wickersham, played by the always reliable Joseph Campanella. The huge banks of massive computers utilized by Intertect would seem quaint by today's standard of small desktop computers, but back then it would have been very impressive. By season 2 however, it was decided that Mannix needed retooling to appeal more to viewers, so Joe was now a private detective operating out of a swanky, Spanish-style office in a well-to-do area of Los Angeles. He also now had a loyal and efficient private secretary, Peggy Fair, played by Gail Fisher. This was notable for that period in the 60s, as Peggy was a young black woman, and race was still a somewhat touchy subject on TV, though things had certainly progressed a lot by then. She was the widow of a policeman friend of Joe's who had been shot and killed in the line of duty, so Joe hired Peggy out of compassion and respect for his friend, and also did what he could to be a surrogate father figure to her young son, Toby. The show was not shy in confronting race issues on several episodes, and I think it did a lot in improving relations, evolving into the more enlightened 70s, where black actors stepped up to play leading roles in their own series. What I love about Mannix and many other cop shows of the era, is the combination of authority and elegance that the various detectives had. One couldn't help but like and admire such characters as Joe Mannix, Steve McGarrett, or my personal favourite, Jim Rockford, as they were truly heroic and chivalrous men. They were unapologetic modern-day white knights, back before TV started to take a turn for the worse, eventually giving the viewer highly flawed "heroes" like what we have today. Frankly, I like my TV heroes to be good, decent, upstanding fellows, thanks just the same. In future blog posts I plan on paying tribute to more of them! 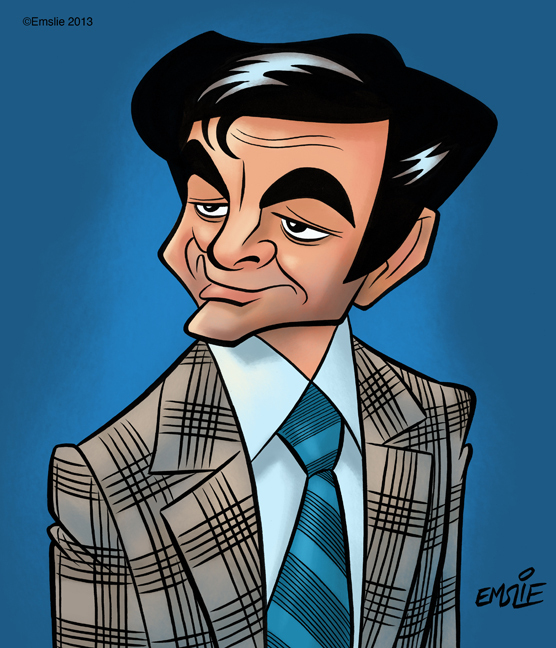 By the way, this Mike Connors tribute is dedicated to a fellow named Dave J. who had emailed me several weeks ago to request I do a caricature of Mannix, as he's also a big fan of the series. Thanks for the request, Dave - it was my pleasure!